A trojan that can hijack a computer and force it into mining for Bitcoins - the virtual currency - has been spreading via Skype. Antivirus firm Kaspersky Labs said attackers sent messages in various languages translating to "this my favourite picture of you". The message included a malicious link which was, at its peak, being accessed more than 2,000 times every hour. The value of Bitcoin has grown massively in recent weeks. At the time of writing, Bitcoin exchange website Mt Gox has the currency listed as being worth $186 (£121). Unlike other currencies, Bitcoins are not issued by a central bank or other centralised authority. Instead users are rewarded in a process called "mining", in which coins are issued to a user when they solve a complicated mathematical problem using their computer. 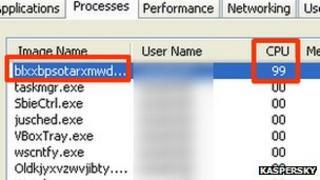 The trojan hijacks a victim's machine and makes it mine for Bitcoins on the attacker's behalf. The greater the number of machines mining, the quicker coins will be harvested. "Most of the potential victims live in Italy then Russia, Poland, Costa Rica, Spain, Germany, Ukraine and others," wrote Dmitry Bestuzhev from Kaspersky Labs in a blog post. The attack "dropper" originates from a server in India, but once installed transmits information back to a control centre in Germany, Mr Bestuzhev wrote. The trojan is able to carry out many tasks, he added, but taking over computers for Bitcoin mining appears to be its primary function. "It abuses the CPU of infected machines to mine Bitcoins for the criminal. "The campaign is quite active. If you see your machine is working hard, using all available CPU resources, you may be infected." Video Bitcoins: Could virtual cash replace money?